Howdy! Welcome and Happy Thanksgiving. Have a piece of pumpkin pie for me – lots of whip cream! This is my last post as Guest Designer for Dreamweaver Stencils and I’m almost embarrassed to tell you how easy this project was. But, like many of you this time of year I have more to do and not enough hours in the day so a quick and easy project is just perfect! This is a cute little holiday decoration and I just am very pleased with the final results. 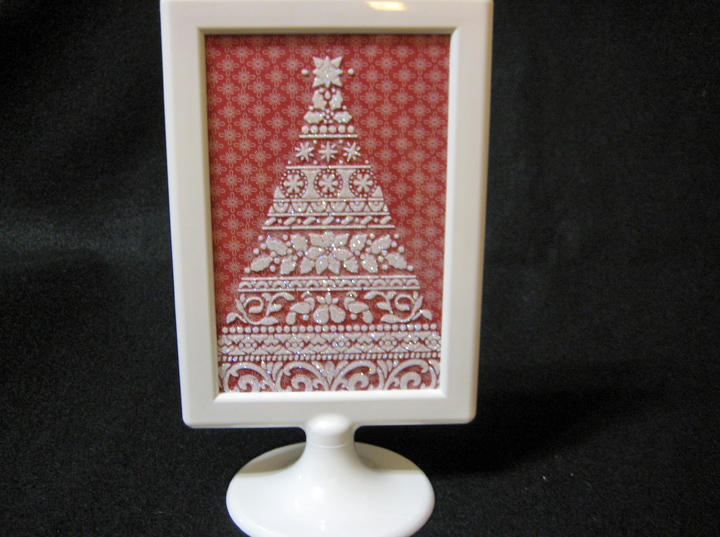 I used nothing more than an Ikea .99 cent frame, Dreamweaver Embossing Paste and the Ornate Xmas Tree stencil and just a bit of Christmas papers from the Bundled Up collection from Crate Paper. This frame comes with two acrylic sheets that I slid out and peeled the protective layers off before taping the stencil to the acrylic sheet. I taped it so it doesn’t slide on me when I spread the embossing paste. 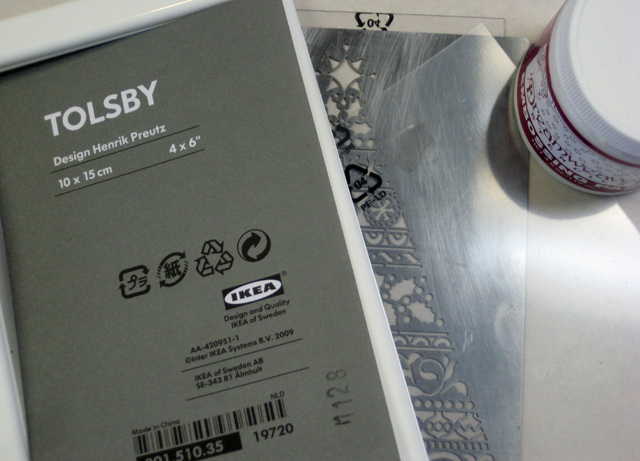 I spread the paste across the stencil to fill in all the tiny details of the stencil then carefully peel the tape away and lift the stencil leaving an embossed pattern on the acrylic sheets; repeat on the second acrylic sheet. 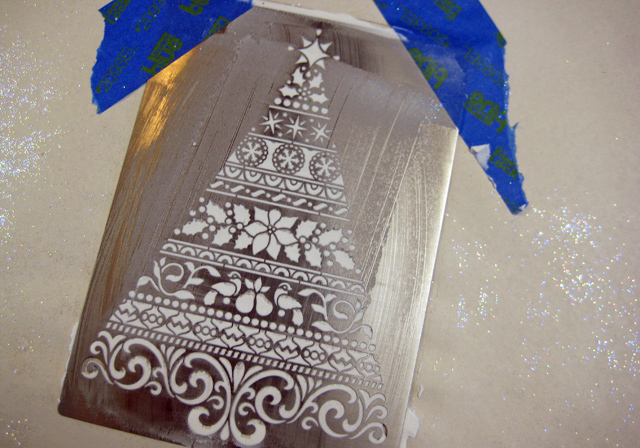 While the paste is still wet I sprinkled with a clear transparent finely ground glitter. I left it sit for an hour or so with the glitter on so the paste would set up and dry. 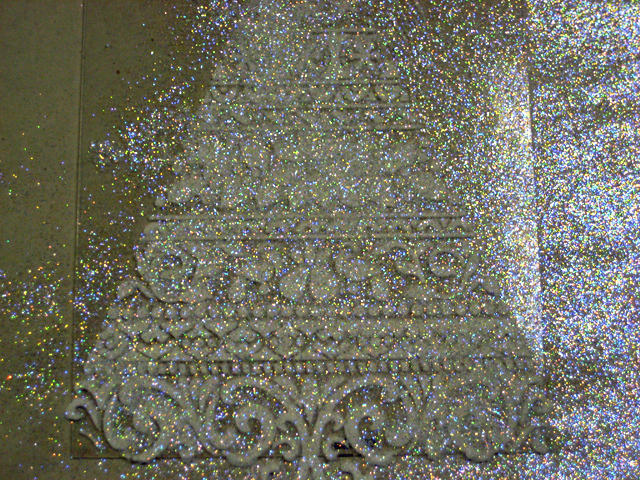 When the paste is dry I tapped the access glitter onto a sheet of office paper and slid back into the glitter container. Then I cut two 4X6 -inch sheets of the paper and slid the paper and the two embossed acrylic sheets into the frame – that’s it! 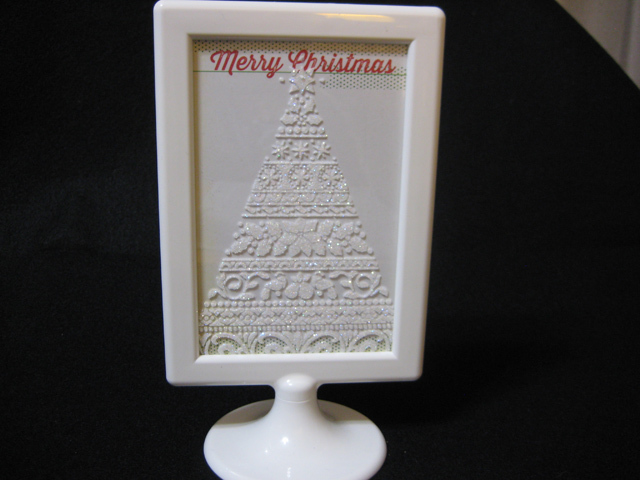 They’re double-sided so what a great little table decoration or a piece to sit on a shelf for the holiday. Like I said, a bit embarrassed at how quick and easy this was. It took me longer to write this post than to make this! Make sure to visit these designers for even more great projects and tips! Now go create! Great project Linda! Gotta love Ikea! Thanks for joining our fun this month! 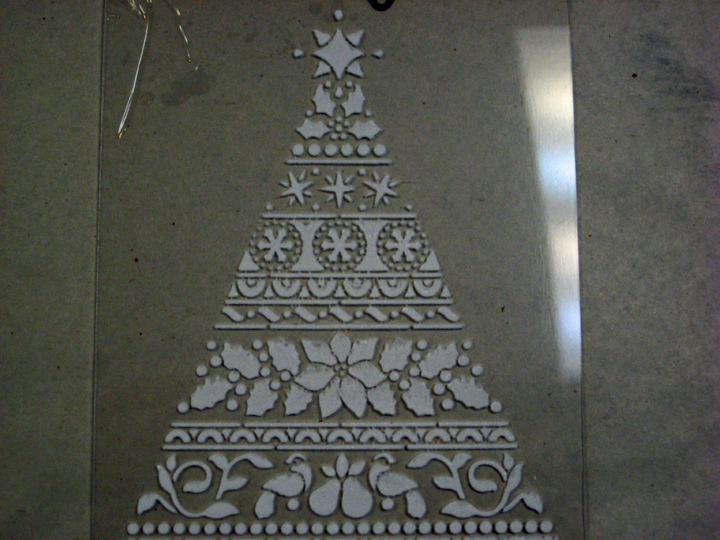 This is a lovely project Linda and the Christmas Tree stencil is probably my favorite! Thanks for guesting with us this month. Come back again, okay? Very fun project. I definitely recognized the frame from IKEA as I’ve spent a lot of time in there lately! Lol. Thanks again for being our guest designer this month. I’ve loved seeing your creations! Too cute, would be a quick and easy card as well.